The user is provided with the ability to display various types of system monitoring charts, save system monitoring reports and export system monitoring results to a number of standard formats including HTML, PDF, Excel, text, CSV and XML. 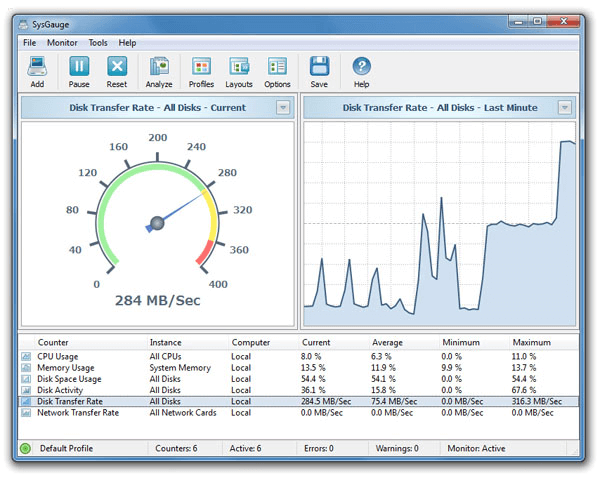 Advanced users and IT administrators are provided with the ability to periodically save system status reports, set user-specified limits for system monitoring counters and then show error or warning messages, play notification sounds or send E-Mail notifications when a system monitoring counter rises above or drops below the user-specified limit. SysGauge v1.7 adds the ability to display pie charts showing the CPU usage per process, the memory usage per process, the number of threads per process and the number of handles per process allowing one to easily identify processes using excessive amounts of the system resources. In addition, the new product version improves the automatic system analysis capabilities and fixes a number of bugs.